The Wedding Mandap is an essential part of Traditional Hindu wedding ceremonies as it is the site for the performance of a number of rituals like the pheras, jai mala, kanya dhan and many other rituals. The Vidhi Mandap is traditionally a four pillared structure meant for performance of wedding rituals and if decorated elegantly can set the mood for weddings. Mandaps today however have taken different shapes and sizes. Couples have begun opting for dome shaped and other themed designer mandaps which bring out their wedding theme in a bigger way. 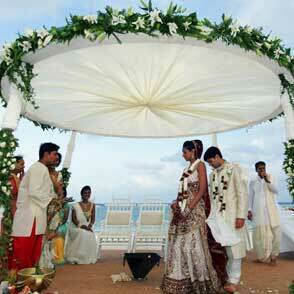 The Jaimala ceremony can also take place at this wedding mandap. However many couples prefer a separate Varmala Mandap stage erected for this purpose which usually matches with the Vidhi mandap. Traditional Mandaps also include the Havan Kund where the sacred fire symbolizes not only illumination of mind, knowledge and happiness, but also a clean and pure witness to the ceremony that is in progress. The couple along with their parents and close relatives are the only ones who sit inside the mandap along with the pandit. 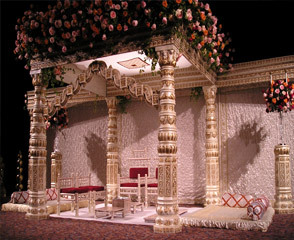 Sankheda chairs which are lower than normal chairs also add a royal touch to the wedding proceedings. Mandaps are usually decorated in ethnic colours like Red, Gold & Orange. 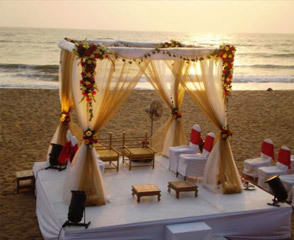 However many couples today want a western touch to their beach weddings in Goa and have started using colours like white, mauve, peach, blue, pink and aqua green in their wedding. The fresh flowers used for decorating the mandap can either be traditional ones like Marigold and Jasmine or more westernized like Lilies and Orchids. 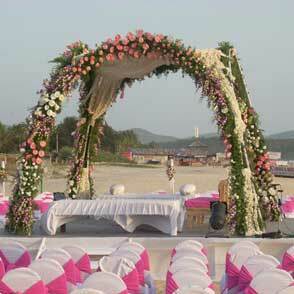 Goa Wedding Decorators will help you create a uniquely designed mandap which will meet your traditional requirements and also satisfy your taste and style. 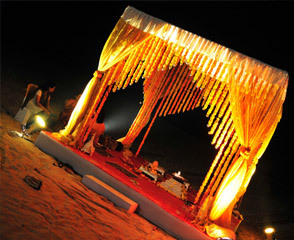 We love designing unique mandaps and creating new concepts which blend into your wedding theme. 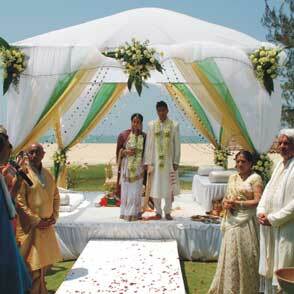 Your dream mandap is only a call away. Contact Us today for new designs and quotations.